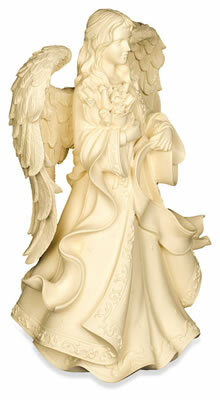 This beautifully detailed angel holds a bouquet of flowers in her arms. At almost two feet tall, this angel can be used as an urn for a large individual weighing less than 360 lbs, or as a companion urn for two individuals whose combined healthy weights is less than 360 lbs. Crafted from high quality cold cast polystone, these beautiful urns have the look of carved limestone. Cremains are easily loaded by removing the plate from the bottom of the urn. *Actual weight = 13.9 lbs. Shipping weight is calculated using UPS Dimensional weight for air shipments since this item is an over-sized package. These urns are suitable for gardens but please note that they will weather over time. Usually ships same business day if order is placed by 3pm Eastern Time. Ships from the West Coast.